I'm finally just about done moving and settling into the new place! That means I can get back into swatching and also not worry about breaking my nails too horribly. I'm really excited that my first swatches at the new house are the Zoya Irresistible Collection. This collection is really amazing. I know not everyone is into the cremes that make up the Stunning Collection, but these should catch your eye if you like some sparkle or shine! I tend to prefer cremes, but I'm really loving these shades. Since they're all so shiny, I think this collection should have been called "Stunning!" I used a base coat but no top coat for all swatches. Tinsley is a rosy pink color. This one is pretty pale and is somewhat of a jelly - it's a little on the sheer side. I used three coats of Tinsley because I wanted to make it look like how it is in the bottle. I got pretty close! Two coats was almost opaque, and three was perfect for this one. The gold sheen looks great with the rosy color. Amy is probably the brightest of the bunch. This orange is super bright and summery! I think this one pairs well with the gold foil finish that the Irresistible collection has. This one is very saturated and covered pretty well in one coat, but two made it look perfect. Kerry is a little on the boring side to me. It's still a very stunning goldish yellow, but I don't think it stands out as much as the others since it's yellow with gold flakes - they're a little too similar. Still, it's very shiny and sparkly. This is almost like the non-PixieDust version of Solange! They're a very similar shade. Also for being such a light color, it covered well. This is two coats, and it was really opaque! I used two coats of Rikki. Hazel is also somewhat of a subdued shade. Like Rikki, it isn't very bright for summer, but is still gorgeous. This one is like a metallic denim blue, and looks like the sun shining on the ocean when the light hits it. I think it's funny that this one is called "Hazel" since I think Rikki looks more like hazel colored eyes to me. But regardless of name, Hazel is a beautiful shade of blue. The gold flakes contrast well with it, and it's really a unique shade of blue in my collection! I used two coats of Hazel. Bobbi is an amazing summertime color. This one is a bright magenta, but it doesn't have the same gold metallic shine that the others do - instead this one is silvery. Bobbi is almost a one coater, which is impressive. One coat was almost entirely opaque, but I applied two just to be sure. I'm really loving this shade a lot more than I thought I would! Overall, I'm very impressed by the Irresistible collection! All of the colors are beautiful, and I like how half are more subdued, and half are brighter and bolder. I think it adds some nice diversity to the collection without them all being super bright or being too bland. They all applied smoothly, and were opaque with two coats, with the exception of Tinsley which took three thin coats for me. Still it is gorgeous and I would recommend that polish! 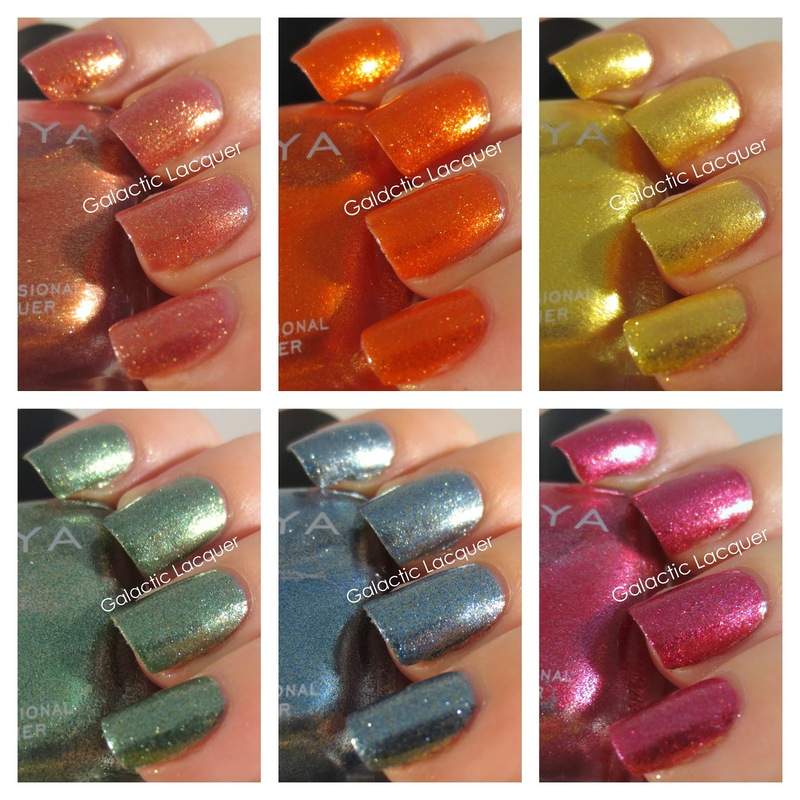 The Irresistible polishes are $8.00 each or $48.00 for the entire set of six, and you can buy them from Zoya's website. 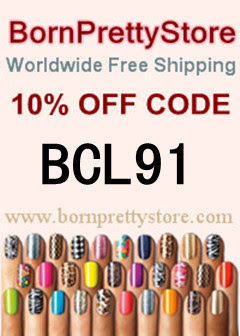 You can also get them for 50% off if you take advantage of Zoya's Earth Day promotion! The promotion continues through the 26th, so grab them for a discounted price while you can. You can read about the details of the promotion here. GORGEOUS, GORGEOUS SWATCHES! I swear, seeing all these swatches everywhere is making me super impatient! LOL! I jumped on the Earth Day promo and ordered the whole Stunning and Irresistible collection last week and I only JUST got a shipping email today, which means I won't get it 'til next week:(. Guess I'll have to settle for a Pixie Dust mani this weekend...maybe Liberty:). Thanks for this post! Your nails are beautiful! BTW: How's the removal on these in your experience? What remover did you use? Sorry for the delayed reply! I've been crazy busy. Thank you! I hope you enjoy both the Stunning and Irresistible collections. I think I like Stunning more, as I'm a big fan of cremes. These ones are very pretty, but they were a little difficult to remove. I think if you use the foil method, or just lay some pieces of cotton on each nail with remover, you should be fine. Scrubbing at them doesn't help too much - the color sort of comes off, and then you still have the foily part to remove! Also the dark pink one (Bobbi) stained my nails pinkish. It's very slight, but just use a basecoat when you use it!